Article originally appeared in Good Grit Magazine, view the article here. Imagine yourself back in November of 1864, when William T. Sherman scorched Atlanta and marched his troops to the sea. Cotton was king and slavery rampant. Elegant white mansions stood alongside log cabins with dirt floors. “Forage liberally on the country,” Sherman instructed his soldiers. “[D]estroy mills, houses, cotton-gins” and freely seize “horses, mules, wagons.” And pillage they did, often to excess, slaughtering livestock and destroying the South’s infrastructure and morale. Yet no towns were leveled on the charge toward Savannah. Some were bypassed entirely, and others virtually untouched. Discover them yourself along a scenic, meandering 100-mile stretch of mostly two-lane roads known as the Antebellum Trail. 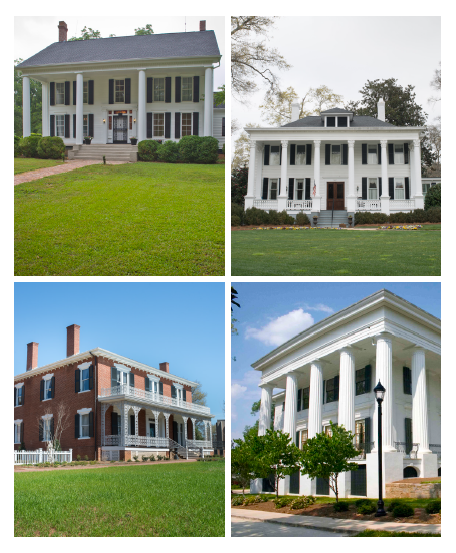 Founded in 1984, the trail links seven communities that have coordinated their efforts to showcase the antebellum history of the region, which has many list - ings on the National Register of Historic Places. Drive north to south, or in the reverse; it doesn’t matter. For added adventure, hop aboard your two-wheeler and travel the 170-mile Antebellum Trail Bicycle Route. On your way, stop first at each town’s welcome center to pick up a walking map or schedule of house tours. At the foothills of the Blue Ridge Mountains, Athens comes first. Sherman promised to make “Georgia howl,” but here the cheers em - anate from the University of Georgia, home of the Georgia Bulldogs. Aglow with pre-war luster, this 1806 college town boasts 17 historic districts and four house museums on Museum Mile. The two-story Federal-style 1820 Church-Waddel-Brumby House features period antiques and a unique soffit molding. A rare Greek Revival beauty with Italianate touches (think lattice-work columns), the 1840s Ware-Lyndon House is the last remaining from Athens’ chic 19th-century Lickskillet neighborhood, and today houses the Lyndon House Arts Center. Wealthy cotton planter Robert Taylor built the 13-columned 1844 Greek Revival Taylor-Grady House (think Greek temple with a flat roof), which has been lovingly restored to historical accuracy, down to the landscaping and wall colors. Last is the T.R.R. Cobb House, a wedding gift from Joseph Henry Lumpkin, the first Chief Justice of the Georgia Supreme Court, to his daughter, Marion, and her husband, Thomas Cobb, a lawyer and outspoken defend - er of slavery. The mansion sports a two-storied portico with Doric columns. Downstairs, the house is rich with original furnishings; upstairs, find exhibits depicting 19th-century life, including Cobb’s weapons and speeches. But the best thing about the house? It’s pink! Next up lies the quaint but vibrant 1802 arts community of Watkinsville. The 1801 Eagle Tavern stands on its original site and functions as a wagon and stagecoach museum in this former frontier town. 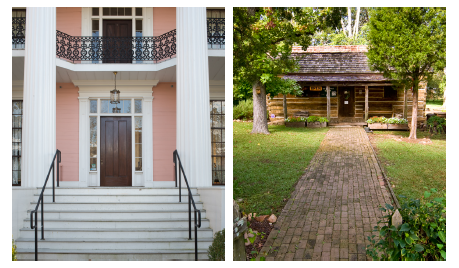 The antebellum Haygood House is now home to the Chappelle Gallery, nationally recognized for fine pottery. Its previous occupant, Laura Haygood, was one of the first Christian missionaries to China. Firmly in horse country as you journey south, you reach Madison, a stunningly preserved jewel of antebellum heritage. Sherman purportedly found Madison too pretty to burn, although, there’s no proof his heart melted. Still, Madison occupies a place on the National Register of Historic Districts, and its numerous accolades include No. 1 “Small Town in America” and one of 16 “Most Picturesque Villages in the World.” Legend also suggests Sherman pardoned Madison as a favor to a resident lady friend or because his buddy, Senator Joshua Hill, owner of the massive white-columned 1835 Joshua Hill Home, simply asked him to. In its heyday, Madison served as a stagecoach stop and in-town residence for wealthy plantation owners. A stroll among more than 50 Neoclassical, Greek Revival, and Romanesque homes leads from breathtaking white-columned mansions like 1811 Greek Revival Heritage Hall, undoubtedly the grande dame, to more moderately-ap - pointed cottages like Madison’s oldest, the 1809–1810 Piedmont Plain-style Rogers House, both open for tours. In spring, azaleas, dogwoods, and magnolias surround Madison’s antebellum treasures. Eatonton sits midway on the trail, cushioned between lakes and national forest. The Uncle Remus Museum, constructed by fusing two slave cabins, celebrates Joel Chandler Harris, born in 1848 and creator of the African-American folktales featuring Br’er Rabbit. Else - where, classic pre-war architecture abounds, including the private - ly-owned 1836 Taliaferro House and Doric-columned Panola Hall, and commercial structures like Temperance Hall. Just outside the downtown area are two must-sees. Oakland Hall, a lavish mansion used for events, is rumored to be haunted by a dis - abled girl who had been locked up by her family. Turnwold Plantation is where Harris lodged, and his stories were largely inspired by tales he heard while visiting slave quarters. 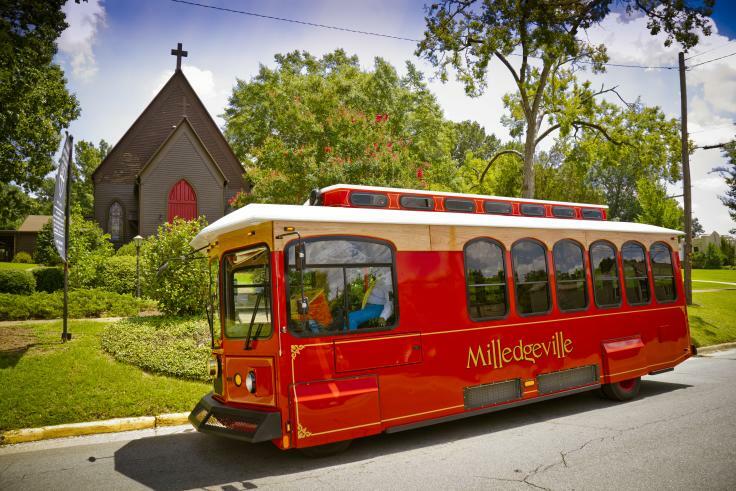 Explore the Museum District by trolley and see the Old Capitol Building, a Gothic Revival gem where Georgia seceded from the Union; Rose Hill, an 1852 Greek Revival mansion surrounded by the 50-acre Lockerly Arboretum; and the Gothic St. Stephen’s Episcopal Church, where Sherman’s soldiers burned church pews and tossed syrup down the pipe organ. Time permitting, visit the Central State Hospital Museum, an 1842 complex that once served as the world’s largest insane asylum. Southbound, visitors enter Jones County. The Old Clinton Historic District features a dozen modest, privately-owned, early 19th-century homes. Nearby Jarrell Plantation offers an in-depth look at life on an 1850s middle-class cotton plantation. Dubbed “The Town Time For - got,” Old Clinton refused to allow the railroad to pass through, hence today’s peaceful charm, which also characterizes neighboring Gray. Finally, get ready for Macon—a fusion of African-American, Native American, and Civil War influences—situated on the Ocmulgee Riv - er. Nicknamed “The Heart of Georgia,” this diverse landscape of plains and rolling hills once served as a Confederate arsenal. 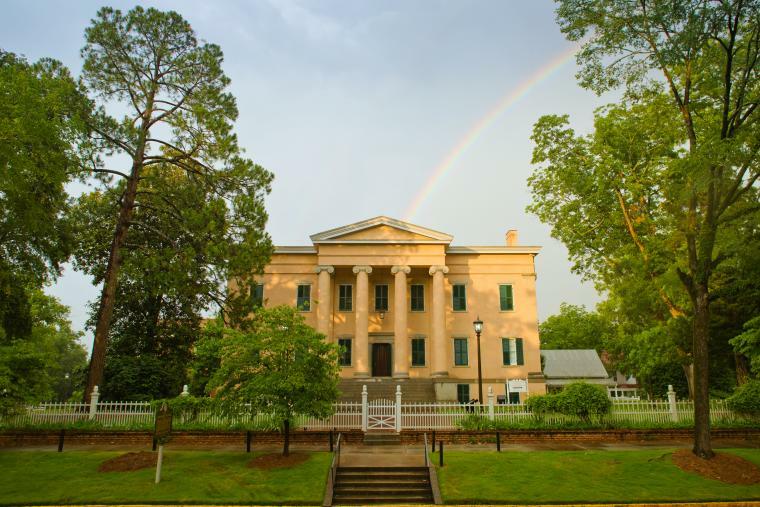 Home to the first chartered women’s college, Wesleyan College, Macon also claims 14 historic districts with more than 6,000 listings on the National Register. Three homes are open to the public. Christened “The Palace of the South,” the Johnston-Felton-Hey House was completed in 1859 after wealthy banker William Butler Johnston and his bride, Anne, returned from a whirlwind honeymoon in Florence and Rome, which inspired this 18,000-square-foot Italian Renaissance Revival home. A three-story cupola crowns this opulent American castle. Inside, a proverbial embarrassment of riches awaits: Carrara marble fireplaces; trompe l’oeil, 24K gold-leaf plaster; stained glass; 32-foot ceilings; hot and cold running water; bathrooms; and central heat. Equally mesmerizing, the antebellum antiquities on display at the 1853 Greek Revival Cannonball House include fine 19th-century furnishings, quilts, and wedding dresses; servants’ quarters; and collections from the Philomathean and Adelphean societies . Enjoy one last glimpse of the Old South at the 1842 Victorian birthplace of beloved poet and musician Sidney Lanier, and feast your eyes on his silver flute, portraits, and first editions. At night, you can re-enter the 21st century and relax at each town’s unique assortment of restaurants, antique stores, shops, galleries, and nightlife. And if time allows, round out your Georgian escape with popular highlights from other eras: the dog statue used in Gone With the Wind (Athens); Elder Mill Covered Bridge (Watkinsville); Rose Cottage (Madison); Alice Walker’s childhood home (Eatonton); Civil War re-enactment held in May (Old Clinton); Flannery O’Connor’s farm (Milledgeville). In his field orders before marching to the sea, Sherman commanded that “[s]oldiers must not enter the dwellings of the inhabitants.” Some soldiers ignored him, of course. Even so, why Sherman spared towns along the Antebellum Trail from Atlanta’s fate remains a mystery. Still, whatever the reason, we can certainly be glad he did.